It’s not uncommon these days for people to relocate to a new city for a job, school or relationship. For some, the thought of being in a new city is exciting, and for others terrifying. Whether you fall in the first camp or the latter, everything about your new city is just that, new. It can seem almost impossible to find your way around the city, let alone find yourself. 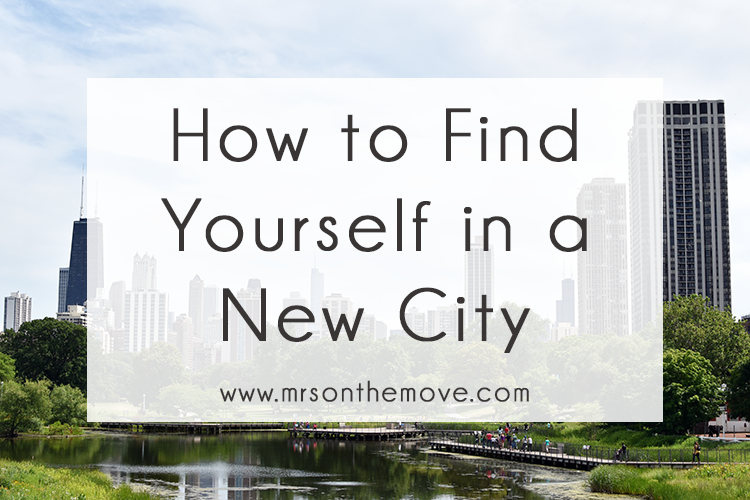 So because I’ve done this whole moving thing a time or two, I thought I would share with you five ways to find yourself in a new city! Every time Kyle and I move, we create a checklist of our most important requirements and try our best to find a place that suits all those needs. Sometimes this is possible and sometimes it’s not, but knowing what’s important and what we’re willing to settle on beforehand makes a world of a difference. Whatever your “must haves” are, remember that at the end of the day you need to live somewhere that makes you happy. For some people being happy in the place they live means being close to their friends, regardless of what else is around. For others this may mean being close to public transportation or within walking distance of great restaurants and entertainment even if friends are a little further away. Keep in mind that there is no right or wrong method to finding a place to live as long as you’re happy! The first few months we lived in Boston, I went on three duck tours. No, these are not tours to look at ducks (which is totally what I thought they were at first). They’re actually a sightseeing tour of Boston in an old WWII amphibious land vehicle! While driving through the city and floating down the Charles River, your conductor spouts off facts about this city and shows you all the fun places to sightsee. No matter where you are, I promise there is something similar. Find your city’s duck tour and go! After you grasp a basic layout of your city, start making an effort to visit one new place per week or month. This doesn’t have to be a historical site or tourist attraction because honestly, these can be really crowded and sometimes boring. Ask your coworkers or friends what their favorite coffee shop, restaurant or place to shop is and invite them to come along! While it’s completely fine to tour the city by yourself, it’s always more fun with friends! This may seem like the most obvious thing to do when you move to a new city, but it is by far the hardest, even if you are an extrovert. Putting in an effort to network both personally and professionally will take some time, but I promise it’s worth it! I can’t tell you how many hours I spent researching when we moved to Boston, but it led me to find an amazing group of bloggers, volunteer opportunities and weekly women’s bible study. The first suggestion I have may be a little too obvious, but easiest place to start networking is at work. While hanging out with coworkers all the time is perhaps not the best idea, it can provide you an outlet to talk to someone who relates to what you’re doing during your 9-5. And as an added bonus they will probably introduce you to some non-work friends! Next, focus on finding people who share the same hobby you do. Utilize Google and Facebook to search for groups and events near you. I’ve found that typing in what you’re looking for in addition to your zip code is the easiest way to search! For me, this was probably the scariest thing when moving to Boston, because not only was I new to Boston, I was also new to blogging. Now, looking back, I am so glad I overcame my fear and went to that first event because not only did I make some great blogger friends in Boston, I learned a lot about my hobby! This is probably everyone’s biggest fear when moving to a new city and I’ll admit it can get quite hard at times. Kyle traveled a lot for work while we lived in Boston, and although it was difficult in the beginning, I learned to cherish my time spent alone. Before you think I’m crazy and wonder why in the world I got married if I like being alone, hear me out. Even though Kyle and I share a lot of interests, there are some things I love to do that he just doesn’t. There’s nothing wrong with that (honestly I think it’s healthy), and truthfully I would rather spend time doing things we both love while were together. In order to overcome the fear of being alone, start by making your home a place you want to be by surrounding yourself with the things you love and creating a relaxing environment. Maybe this means a stocked kitchen to cook in, an area to pursue your hobby or a comfy couch to watch your favorite shows. Whatever you love, make time and room for it! If after a while you’re still feeling alone and your schedule allows, consider adopting a pet! Pecan was by far one of the best decisions we made and I honestly can’t imagine life without him. Having him keeps us active, makes me feel safer when I’m walking by myself and he’s a pretty darn good snuggler! You’re going to be very busy making new relationships, don’t forget about the old ones! Social media makes it easy to stay up to date with people’s lives, but I can’t stress the importance of actually keeping in touch. Maybe this is a weekly phone call with family or a no-pressure group text amongst friends. Everyone’s schedule is different, so just find what works for you! While all of these tips will be helpful in adjusting to your new city, they won’t work unless you are willing to push yourself out of your comfort zone. Even though it’s important to challenge yourself, remember that everyone adjusts at their own pace and there is no right or wrong way to do so! I hope these tips will help you adjust to your new city and if you’ve just moved to Chicago, I’d love to connect!